The K7M engine is 1.6-liter motor based on K7J components, in other words, it is the more powerful version, which offers more driven comfort without significantly increasing of fuel consumption and the cost of 1-mile driving. The K7M engine cylinder block is taller than K7J block. That is because there is another crankshaft and the engine has the increased by 10.5 mm stroke. Pistons of both the K7J and K7M have the same diameter, but K7M pistons have another compression height. Other parts are identical - the aluminum SOHC 8-valve cylinder head, connecting rods, oil pump, intake and exhaust manifolds. The engine has timing belt also. The 1.6l K7M featured multipoint fuel injection system and exhaust gas recirculation EGR emission control system. This 1.6-liter engine is preferable than the 1.4-liter engine for daily driving, and that because a lot of buyers stopped their choice on the K7M engine. 1. K7M engines suffer quite severely from head gasket failure (mixing coolant and engine oil) due to a weak coolant pump and overheating. 2. The engine operates like a diesel due to worn out camshaft bearings. That can happen nearly at 40,000-50,000 mileage (60,000 km). But in fact, the engine is very reliable. It is equipped with simple, cheap and time-tested technologies. The engine life of the K7M is 250,000 miles (400,000 km). K7M702/703/790 - 90 hp (66kW) engine for 1995-1999 Renault Megane, Renault Scenic. K7M720 - 75 hp (55kW) engine for 1995-1999 Renault Megane, Renault Scenic. K7M744/745 - 90 hp (66kW) engine for 1998-2003 Renault Clio II. 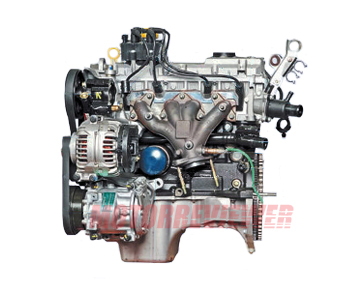 K7M710 - 86 hp (64kW) engine for 2004-2010 Dacia Logan and 2008-2010 Dacia Sandero. K7M800 - 83 hp (62kW) engine for 2011-p/d Dacia Logan and Dacia Sandero. K7M812 - 80 hp (60kW) engine for 2012-p/d Dacia Lodgy and Dacia Dokker.